I noticed Julie Klassen in my last CBD catalog. I immediately put two of her books on my paperbackswap’s wishlist. I just received my copy of The Apothecary’s Daughter a few weeks ago. I have only read one book by Jane Austen, but I have watched several movie adaptations of her books. Right from the beginning of The Apothecary’s Daughter, I felt like I was watching an Austen movie or several episodes of Cranford. I could picture in my mind everything about Klassen’s imagination-born village of Bedsley Priors. In this village, lives Lilly Haswell. Lilly helps her father run his apothecary shop, while keeping watch over her brother and the new apprentice. A surprise visit from an aunt and uncle gives Lilly the chance for a life in London, far away from the medicinal life she knows. Lilly, eager for the change, is swept into high society until a letter summons her back to Bedsley Priors. Leaving suitors behind, Lilly returns home to find her father strangely ill and the apothecary shop near ruin. I really enjoyed the story of Lilly Haswell. I wouldn’t call The Apothecary’s Daughter “slow” reading, but, like an Austen movie, you really have to be paying attention or you’ll miss something important. Well researched, well written. 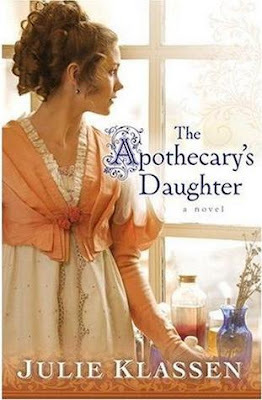 If you like Regency-inspired romance, you might give The Apothecary’s Daughter a try. 416 pages by Bethany House. love all the recipes......the hoho cake looks AMAZING!!!!! we may have to try that one at our house!!!!!! Sounds like something I would enjoy reading. Over from SITS to say hello! I love to read and am always looking for good recommendations! Thanks! Stopping by from SITS! !